Crumbling Control by May Freighter is the third book in the Helena Hawthorn series. After the fallout from the Demon Gate, Helena is invited to stay with Vincent, a prominent member of the European Vampire Council. Reeling from the guilt over the loss of two friends, Helena doesn't want to see anyone else die, but as the vampires and hunters prepare for war, she knows she won't be able to keep those she loves safe. Lucious is injured and on the run with hunters close behind. His only option is to turn to someone who once betrayed him. When Helena can't get in contact with Lucious, she begins to fear the worst for their relationship. She doesn't have long to dwell on this as their situation goes from bad to worse when the local werewolf packs prepare to fight over territory, a betrayal threatens to destroy the Council, and an ally returns bent on revenge. Most of the story deals with the fallout from Demon Gates as Helena and Lucious both struggle to deal with the consequences of their decisions and their soul-bound relationship. Crumbling Control goes deeper into Lucious's history, giving readers an opportunity to understand his actions and how he thinks. His background also includes a fun connection to the real-life history of London with him filling the role of Jack the Ripper. May Freighter explores more of the vampires' origins with a detailed mythology that opens up the world into new directions. The relationship between Lucious and Helena is stronger than ever, because they're finally trusting each other and bringing their walls down to let the other in. The romance is sweeter with more loving scenes between the two, but they maintain their usual chemistry, flirtation, and drama. Helena's place in the story is interesting as she's able to sympathize with both sides and, despite their actions, she can humanize them. Through her it's easy to get a better understanding of where both sides are coming from and what's driving them. 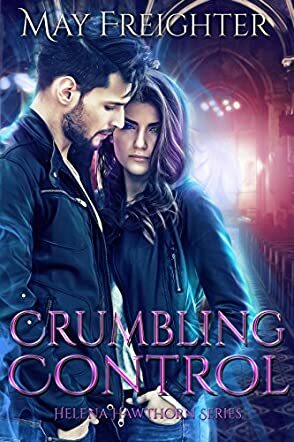 Crumbling Control is a brilliant read, full of danger and betrayal with romance and heartbreak.